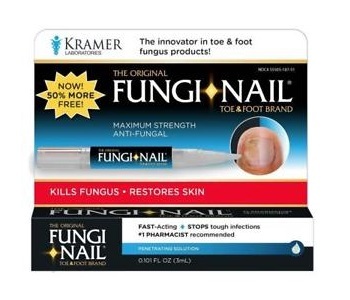 Kramer Labs Fungi-Nail Toe & Foot Brand Review - Does It Work? The following review is for a product called Kramer Labs Fungi-Nail Toe & Foot Brand. 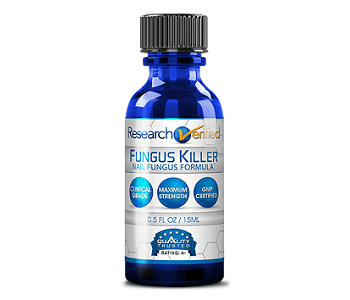 It is a formula that is designed to provide relief from fungi, such as athlete’s foot and other fungal infections, and to restore skin’s healthy PH. Undecylenic Acid is the active ingredient in Fungi-Nail Toe & Foot Brand. This ingredient relieves itching, burning, and irritation associated with skin disorders, such as fungal infections like athlete’s foot and ringworm. Wash the affected area with soap and warm water, and dry it. Use the brush applicator to apply a small portion of the solution onto the affected area two times a day, in the morning and evening. Do not forget to also apply it on spaces between the toes for athlete’s foot. Wear well ventilated shoes and change your socks at least once a day. 1fl.oz. costs between $8.82 and $9.98 from various online third-party retailers. There were no discounts available at these retailers at the time of our research. The manufacturer does not sell the product on their website. Undecylenic Acid can cause side effects like severe stinging and burning of the skin. Less serious side effects include irritation, dryness, peeling, itching, blistering and irritation.Contact the Poison Control Centre immediately for advice in case of ingestion.Do not use it on children under the age of three, unless instructed to do so by a healthcare practitioner. There is no indication of the manufacturer’s money-back guarantee, which is disappointing and concerning because this means that you cannot be refunded if you are unsatisfied with the results. The good thing is that there are positive reviews on this product. However, there are also many critical reviews, with some of the customers claiming that the product does not work. Kramer Labs Fungi-Nail Toe & Foot Brand might be effective in providing relief from a number of skin fungal infections. The main ingredient is known for its strength in getting rid of fungi. It’s price is reasonable. However there are many things that we do not like about this formula. We noticed that even though the product’s name gives an idea that it designed for nail fungus, it is actually stated on the label of the product that it is ineffective on nails. This is very disappointing, as it a false advertising. Moreover, many consumers on the reviews stated that the product does not work. It is hard to trust a product with these downsides, especially when it is not even backed by the manufacturer’s money-back guarantee. The lack of guarantee indicates to us that the manufacturer is not confident about the effectiveness of the product. It also puts the customer at risk of losing, because the product might not work, or it might cause side effects. When this happens, the customer loses their money, and their health is at danger. We are also worried about the side effects that one might experience from the ingredient. We recommend that you look for another product.